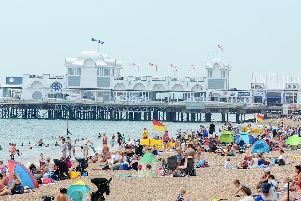 Temperatures are set to sharply fall in Portsmouth this week after a mild start to autumn. The city basked in gloriously sunny and warm weather over the weekend – making perfect conditions of this year’s Great South Run. However a shift will arrive by the end of the week, the Met Office is forecasting, with wide spread frost and colder temperatures set to hit the UK. A Met Office spokesman told Sky News: ‘It will turn a lot colder as we head towards Friday and the weekend. The Met Office’s outlook from Friday (October 26) to Sunday, November 4, is for ‘widespread overnight frost is likely, with icy stretches where showers have occurred’. ‘Spells of rain could affect the east and southeast for a time, before a more generally changeable pattern develops as we move into November.